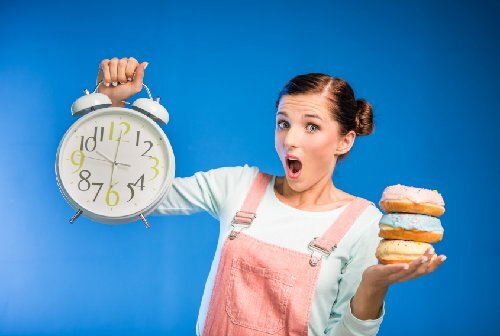 Time-restricted eating is a type of intermittent fasting—and it is the latest phenomenon that has been studied extensively. This way of eating focuses on when you eat. Basically, all food is eaten within an allotted time period. In a new study published in the journal eLife, University of Southern California (USC) researchers found that rats with restricted feeding schedules learned to eat more with the hormone ghrelin. It plays an important role in weight gain and hunger, and therefore it is also called the “hunger hormone.” The goal of the experiment was to learn how the signals and connections of ghrelin work in the brain, especially when it comes to impulse control. Ghrelin levels are at the highest when the stomach is empty. Some time-restricted eating plans will require food consumption for only eight hours during your waking hours. For instance, you could skip breakfast, eat lunch at noon and finish dinner at 8 p.m.
For the study, the eating time for rats was restricted to a four-hour window daily, and for 20 hours the rats did not consume any food. The rats increased their food intake until it doubled after learning they had limited access to food. The hormone ghrelin allowed the rats to reduce their feeling of fullness and eventually their food consumption increased. “This is an adaptive response to limited food access, but one that is no longer relevant in the Western world, where instead we need to find new ways to help us fight some of the feeding responses we have to external cues and circadian patterns,” explained lead study author Scott Kanoski, of the USC Dornsife College of Letters, Arts and Sciences. The study helps explain how ghrelin communicates with the brain and central nervous system to control food consumption. Ghrelin communicates with hippocampus neurons, which stimulate appetite. This mechanism allows for large food consumption in a short time period. The neurons also communicate with another part of the brain called the hypothalamus. This produces the molecule orexin, which then promotes excessive eating. Previous studies from the research team discovered that ghrelin increases the food intake of rats by signaling the hippocampus. This happens as a result of a visual signal the rats associate with an upcoming meal. In humans, a vending machine or fast-food billboard may trigger the difficult to resist desire to eat food. Ghrelin also increases the rate where nutrients move through the body. This process should be slow rather than fast to help create the feeling of fullness for a longer time period. In the U.S., over two-thirds of people are overweight or obese. As a result, study researchers felt obliged to discover new ways to fix the problem—specifically through studying ghrelin and time-restricted eating. The research team is working on ways to decrease ghrelin’s effect. They are genetically suppressing ghrelin receptor activity in the hippocampus, which interferes with neurochemical signals that lead a person to consume large amounts of food. Many studies show that time-restricted eating can improve weight loss and metabolism, and prevent against cardiovascular and brain-related diseases. Hsu, T.M., et al., “Hippocampus ghrelin signaling mediates appetite through lateral hypothalamic orexin pathways,” eLife, 2015; 4, doi: 10.7554/eLife.11190. “Hunger hormone is boosted by restricted meal times,” ScienceDaily web site, December 15, 2015; http://www.sciencedaily.com/releases/2015/12/151215091401.htm. Lees, K., “Hunger Hormone ‘Ghrelin’ Boosted By Restricted Meal Times,” Science World Report web site, December 15, 2015; http://www.scienceworldreport.com/articles/34205/20151215/hunger-hormone-ghrelin-boosted-by-restricted-meal-times.htm. Gunnars, K., “What is Intermittent Fasting? Explained in Human Terms,” Authority Nutrition; http://authoritynutrition.com/what-is-intermittent-fasting/, last accessed December 16, 2015.